The following text is an abridged and edited transcript of the video that follows at the end of this post. Time codes are provided in the below text to help you follow along in the video. I want to share with you how I think about web scraping, the process of extracting large amounts of data from websites. I’ll admit, when I first learned how to scrape pages off the internet, it was very confusing. There didn’t seem to be much logic or reason to it — two characteristics that are very near and dear to my scientist heart. However, as I learned more about the structure of HTML pages and beefed up my Python skills, things started to click. Now when I have to scrape a webpage, I use the same process — one I’d like to share with you. But before I do that, I want to point out how important it is to know what question you’re trying to answer before you begin web scraping. If you don’t know your question, how will you know the answer when you see it? So make sure you have that question in mind before you begin. <b>This is bold text.</b> This is not. This is bold text. This is not. <b>This is bold text. <i>This is bold and italic text.</i></b> This is plain text. This is bold text. This is bold and italic text. This is plain text. The fact that tags can be nested is key to finding a starting point for scraping the page. But first you need to know what you’re looking for. To do so, you need a little knowledge about HTML and how Google Chrome Inspector works so that you can find the HTML code related to the piece of content that you want. Because the code for a webpage may change often, web-scraping scripts are fragile: You can build the Best Script Ever only to have it rendered useless when the code to a page is updated. 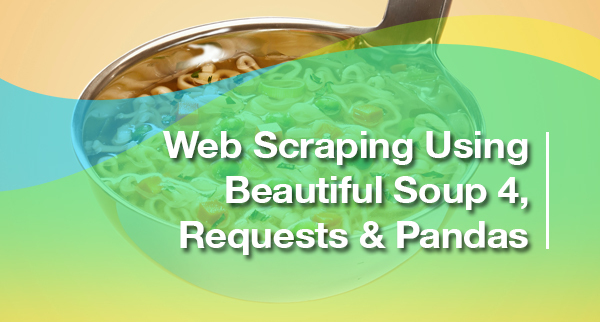 For this reason, web-scraping scripts need to be developed as close to possible to when they will actually be used. The scraping process itself is very analytical and requires a lot of trial and error to get what you need. You need to look at the webpage code and decide what tool will allow you to extract the data you’re looking for. That’s where Jupyter Notebook comes into play. The open-source web application allows you to iterate through the process to eventually get the data you need. With both of these tools in hand, you’ll still need to test and debug on the fly. That’s just the nature of web scraping. Once you’re done, make sure to store the data in a database or CSV file because, as I said, the handy-dandy script that just extracted all that data might not work on the same webpage next week — or even tomorrow. Now that we’ve covered those basics, let’s pick a page to scrape. 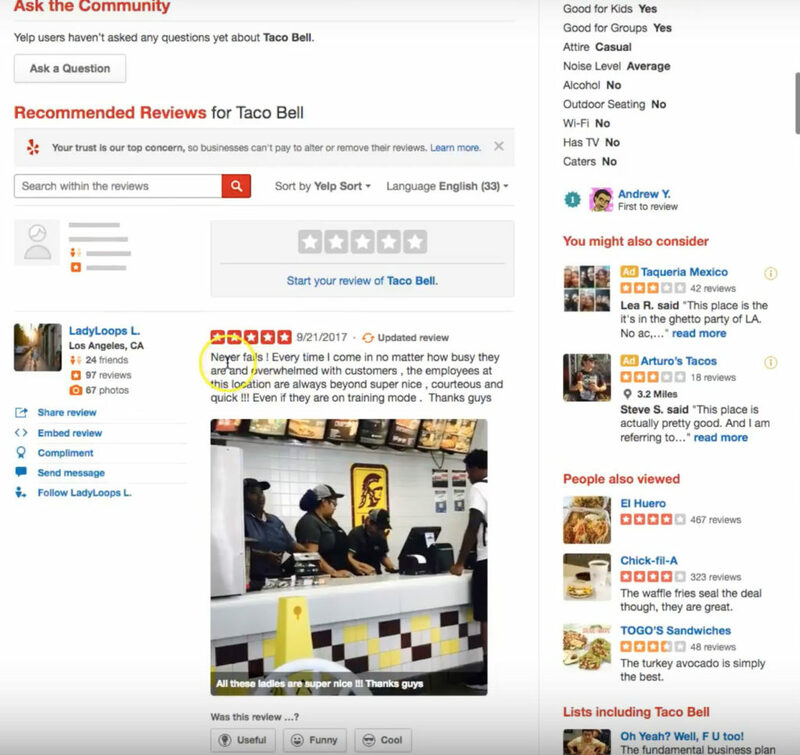 I chose to scrape some Yelp reviews of Taco Bell because, well, who doesn’t like Taco Bell? I’m only going to scrape the reviews off this one page. If we want to scrape all the reviews, we’d have to change the structure of the HTML in the script or use a tool like Splinter to iterate through the pages. But for the purposes of this lesson, we’ll just scrape the first review page for this Taco Bell location. [6:59] The data we’re extracting is the review itself and the number of stars for that review. To do so, we’ll first use Google Chrome Inspector to view the code. 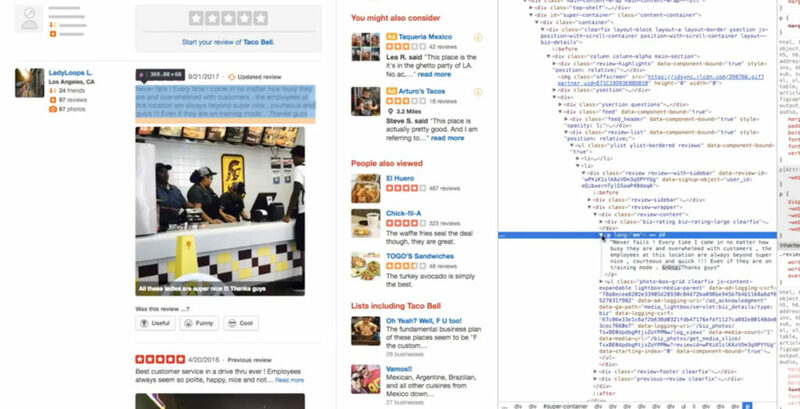 If this is your first time using Inspector, you might feel overwhelmed. But here’s what’s neat: You go to the live page, highlight the text you want to extract, then open Inspector and voilà! You can see where in the HTML code that is. In this case, the review text I’ve selected is between <p> tags. As you move up and down the code in Inspector, you can see the related live-site content on the left highlighted. What we’re trying to discern is whether there’s a single tag that contains all of the information we’re looking to scrape and, if so, does that tag also contain information we don’t necessarily want? [8:10] When I select the <div class=”review-sidebar”>, I can see that it highlights the review from LadyLoops L. And if I go to <div class=”review-wrapper”>, the review is highlighted, but if I go to <div class=”review-content”>, it contains the review plus the star rating — which are the two pieces of information I want. It’s always a good idea to inspect another part of the page to see that you correctly understand the structure, so I’m going to jump to another review. So after scrolling down in Inspector, I come to another <p> tag and can see the related text on the left highlighted. And if I choose the <div class=”review-content”> tag, you can see the review on the left has both the text and the star rating. At this point, I’m going to assume that <div class=”review-content”> contains all the information I want for the scraping job. I’m also going to make an educated guess that this tag contains other information as well, but that’s okay. This returns Response , which means the script made a request to the server for the URL and then the server successfully responded back with the data. It’s very important to check that the script is working because you don’t want to continue only to find out that you were unsuccessful at making the connection in the first place. This feeds the data into Beautiful Soup using an HTML parser, although sometimes LXML parser also works. This line of code is taking the data it got back from this get request and storing that in this Beautiful Soup object. Let’s see what the data looks like. This is really hard to read, but it doesn’t matter because we know what tag we’re going after. Now that we have the data stored in a variable called page data, we want to find all the information within the tag that we selected, <div class=”review-content”>. This command returns all the information that is a child of <div class=”review-content”> and stores each occurrence in a list. That’s important to know because we’re going to have to iterate through this list later to get what we want. Yes! This verifies that our assumption is correct, that by finding all the instances of <div class=”review-content”>, we got the information that we wanted (in addition to more stuff). You always want to approach the first step by returning far more than just the information you want. It’s better to have more and then pare back as opposed to having less, because you won’t be able to grab more later. So use find_all to cast your net far and wide. That gives this result: “I love Taco Bell and not afraid to say it,” which is the second review on the live site. [20:23] Great! We’re in the right area. Up until this point, we’ve written short snippets of code to get the information that we want for each entry based on all of this “data soup.” But we’ve only returned the first entry. If we want to return all the entries, we have to reiterate through each value of this soup data object to generate a list. We can do that by generating a for-loop to iterate through each entry. Now we want to store this in a list and then send it a dictionary. I also want to create three columns on my DataFrame: review, to hold the text reviews; star_number, or the numerical value of the star rating, and full_rating, which should be the text string of the full rating. There it is! Every Yelp page has 20 reviews — and that’s what we have here. And it’s exactly what we wanted: star number, review, and full rating. So that shows that we’ve got everything that we want. Now we need to find the CSV file, which was saved in the root of the notebook I’m running, and open it up. Here’s a link to the file on Github. So now we have a copy of we’ve done and if we want, we can load it back into Pandas at a later time. 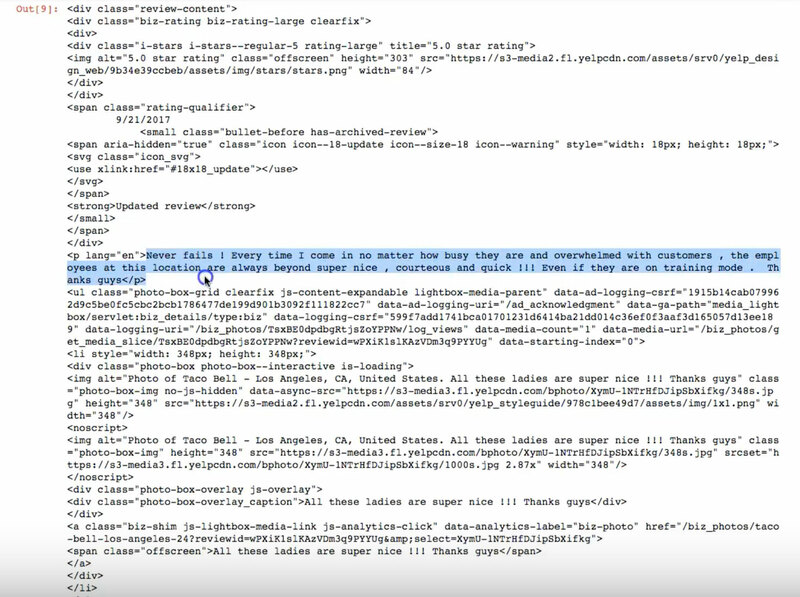 When you’re looking through the HTML, you want to use Inspector to find the tag with the information that you want and then some. In this case, it was <div class=”review-content”>. Once you know what tag you’re looking for, you go fishing for that tag using find_all in Beautiful Soup. That command returns all the data in the <div class=”review-content”> tag. I only used find_all once because I cast my net only one time. Every subsequent time that I traversed down, I used “find” because I was looking into the net of soup data that originated from find_all for specific tags. 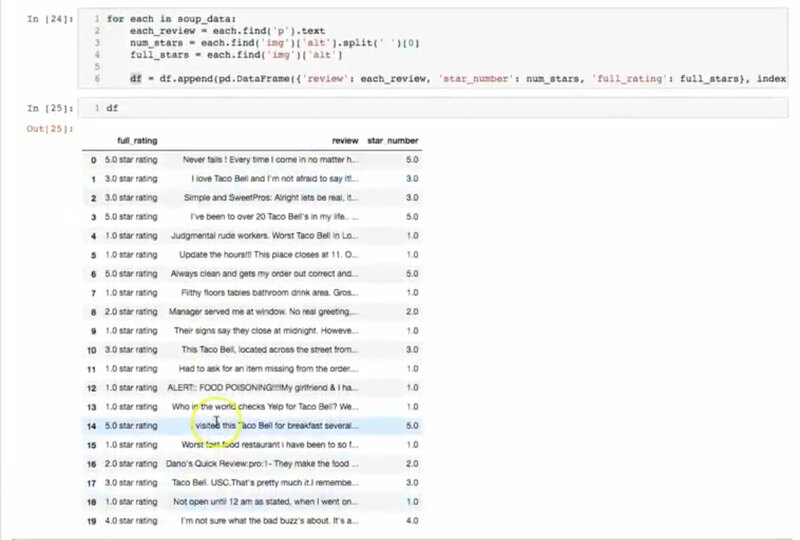 Everything is stored in soup data using find_all, but then I used find to look for the <p> tag. When I was looking for the star rating, I found image using find. To me, that was the most confusing part about web scraping, but once I looked at the process as a net metaphor, it finally made sense. You can review the code and related files in my Github repository. If you have any questions, I’m happy to discuss! Just leave a comment below or shoot me a message.